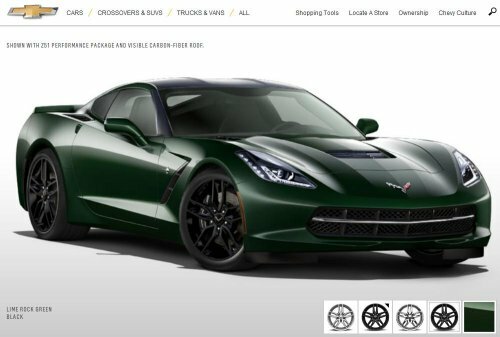 GM hasn’t launched the full configurator for the 2014 Chevrolet Corvette Stingray coupe just yet but the Chevrolet website does have a new page featuring the C7 Stingray called the “colorizer” – giving hopeful Corvette buyers and the automotive dreamers a chance to check out the new American sports car in all of the available color options. The 2014 Chevrolet Corvette Stingray Coupe colorizer is one of the final pages found on the new 2014 Stingray mini site and while this feature falls well short of a full configurator, this page gives us a chance to see the new C7 Vette in the colors that will be offered when the car hits showrooms later this year. This includes 10 different exterior colors and three different wheels finishes, all shown with the same Corvette Z51 performance package and visible carbon fiber roof that we saw at the debut last month. Based on the colorizer, it looks like the 2014 Chevrolet Corvette Stingray Coupe will be offered in 10 exterior colors at launch including the Torch Red and Cyber Grey Metallic hues that we saw at the debut and at the 2013 Detroit Auto Show as well as the Laguna Blue Tintcoat that we have seen in the infamous “crash photos” that we talked about last week. (Click here for a look at the wrecked 2014 Corvette in Laguna Blue). In addition to those colors that we have already seen either in person or in pictures, the 2014 Corvette Stingray will also be offered in Crystal Red Tintcoat, Night Race Blue Metallic, Black, Blade Silver Metallic, Arctic White, Velocity Yellow Tintcoat and my personal favorite, Lime Rock Green (shown above on the right). The 2014 Corvette Z51 package comes with a unique set of split spoke wheels measuring 19 inches up front and 20 inches out back and it looks as though those wheels will be available in Sterling Silver, Chrome or Black…with Black being my choice but I love black wheels. We can expect that the Corvette will be offered with the visible carbon fiber roof shown on the colorizer but for those who want a more uniform exterior, they will be able to opt for a painted carbon fiber unit. There will also be a transparent removable roof for those who want that open sky look when the top is buttoned up. The 2014 Corvette colorizer page also allows you the option to scroll over to a specs page that offers a quick rundown of the vital figures of the new Stingray. This includes the new 6.2L LT1 V8 engine, the choice of either a 7-speed manual transmission with active rev matching or the paddle shifted 6-speed automatic transmission, the three chassis packages including the standard model, the Z51 and the Z51 package fitted with the magnetic selective ride control system, the available trimlines of 1LT, 2LT or 3LT and the option rim sizes that are all wrapped in Michelin Pilot Sport ZP tires. This spec sheet doesn’t tell us how much the 2014 Corvette will weigh but it does boast of a perfect 50/50 weight distribution which should help make the C7 Stingray an incredible handling supercar – although that was pretty much assured before we ever saw the new Corvette. Just in case you have missed any of the in-depth videos offered by General Motors, the 2014 Chevrolet Corvette Stingray mini site has a collection of all of those videos along with high resolution photography of the new Vette. Click here to head over to the 2014 Corvette page to build your own ideal Chevy supercar!